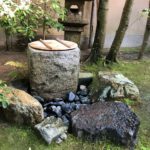 A stone in the Roji that has been carved so that it can hold water. This water is used for purification before entering the tea room. The guest use tsukubai hishaku to scoop out water and purify first left hand, then right hand, then mouth. During a chaji the host will use water from the tsukubai to sprinkle in the guarden, and then refill the tsukubai. 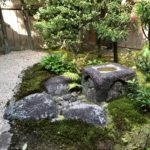 Traditionally the tsukubai is surronded by rocks. Some small for spill water to drain, and some large to place a candle and waterbucket on.